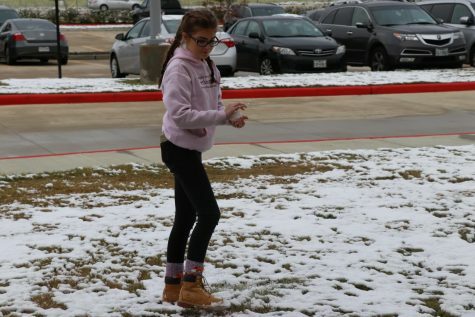 It’s been eight years since the last time it snowed in Klein, Texas, and students woke up to a big surprise Friday, Dec. 8 as a blanket of snow covered their cars and houses. People got to see and experience the rare winter wonderland even if just for a few minutes. “Last time I had snow, it was like 10 years ago, so I was like, there’s snow outside? 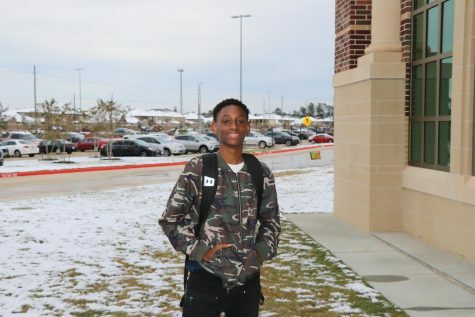 I haven’t seen snow in a long time, so it was cool just to see the snow outside,” Damon Darby, freshman at Klein Cain, said. looked out their windows not sure of what to expect or thinking of it as another normal day. “It was a surprise. I’d just seen snow and I was like ‘huh?’. And I see other people telling me it was snowing. Then, I looked through my window and my mom and dad’s car had snow on it,” Darby said. Though there wasn’t much of it, students eagerly got up to take advantage of something that they hardly get to see. Buses stopped to let the kids play, people gathered around and made snowball fights, and most of all, everyone had a chance to see snow for the first time in about a decade. “I was in the first grade when I had snow. That was the last time I’d seen snow, we had a few drizzles and stuff of snow, I think it was a few years ago. Then, we had a hailstorm or something like that,” Darby said. The snowy day had been something many had dreamed and hoped for each winter, and now their dream had become a reality. “I was waiting for it, it was happy. My mom said she prayed for snow, so when she saw snow, she was happy, so it was really unexpected,” Darby said. “We had snowball fights this morning. Me and my friends were throwing it. I didn’t really get in snow because I didn’t want to get my shoes too dirty, so I had to pick up the snow from the edge….it was cool,” Darby said. Having lived in Texas for most, if not all, of their lives, the sudden appearance of snow had been unexpected and wasn’t something that had been prepared for in advance. Not all students were adequately dressed for the occasion, as some of the clothing lacked proper insulation from the freezing weather, and nice shoes were at a risk of getting muddy or wet with the damp terrain and puddles of water. “I had like two seconds to go outside and make a small snowball and throw it at my sister. That was it though, then I walked into it going to the bus stop,” sophomore Lexi Anderson said. Knowing it was still a mandatory school day, Anderson and many others had a limited time to play or enjoy the snow as their bus came to pick them up for school. The fun was cut short having to get to school on time due to classes not being canceled. “It was cool to see everybody interact and stuff with it because it’s rare that we really get snow like this, so when we get it like this we try to make the most of it,” Darby said. Tennis courts covered in frost during the 2018 snow. Photo by Enrique Paz.